If you’re an artistic person who loves to create visual art that inspires and motivates people to take some sort of action, the design industry has some good news for you. The profession of graphic design is becoming more and more recognized as a great way for artistic people to make their ideas a reality, while also getting paid an awesome graphic designer salary. Truth be told, however – some people might find it hard to choose whether or not this career path is for them. In these cases, knowing the facts about how much do graphic designers make can easily sway you into one side or the other. 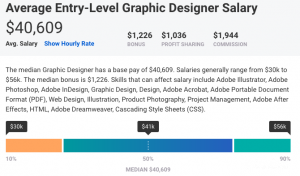 If you’re wondering about the average graphic designer salary, you’ve come to the right place! First of all, we’ll talk about the job description of a typical graphic designer. This will help you understand what these people do on a daily basis a little better. After that, we’ll move on to talking about the main types of graphic designers, and then – finally – we’ll cover the graphic design salary itself. So, first things first – what in the world is a graphic designer? Graphics designers are people that work on certain specific artwork. 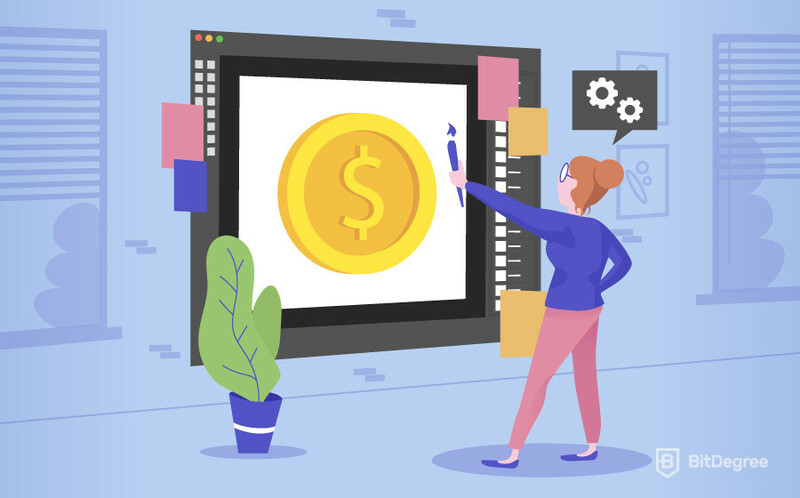 This artwork is usually used for commercial purposes, meaning that a graphic designer works in companies and receive a stable graphic design salary. However, it is worth mentioning that this profession does allow you to work from home, as a freelancer – it all depends on the deal that you make with your employer. 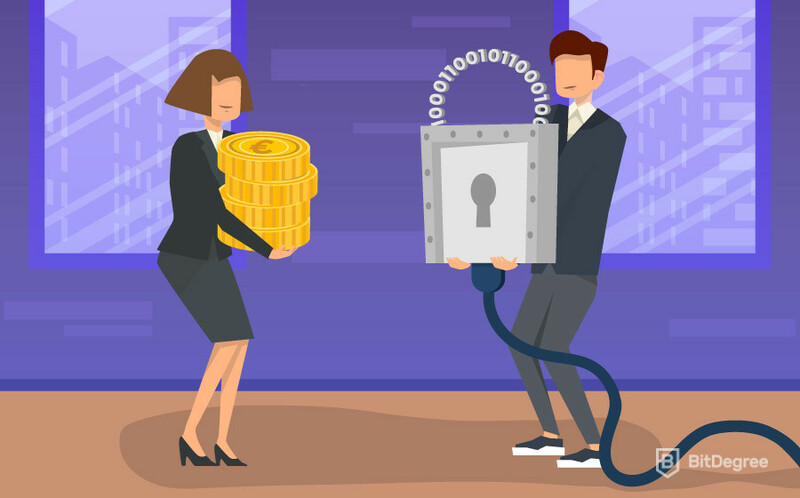 The designs that these people create are most commonly used to persuade a consumer to purchase a certain specific product or a service from the company. That being said, however, this does not mean that graphic designers are only concerned with specific, unique projects – their job description also involves a lot of working with general designs, such as the main layout design of a company’s website, their logo, etc. Freelance graphic design has both its pros and its cons. While you are able to decide how much does a graphic designer make on your own, you also have to work closely with your customer, make constant adjustments and meet very specific deadlines. Graphic designers have to be very flexible and responsible workers. It’s not enough to be a creative person – you have to be able to provide multiple variations of the same thing, work on the same project for countless days on end, meet all of the deadlines and be able to negotiate with your clients or employers. It’s a tough job! Now that you know a little bit about the profession of a graphic designer, there’s just one more thing that we need to cover before jumping into the average graphic designer salary analysis – the different types of graphic designers that there are. If you’ve ever had a day job, you probably already know that jobs have different titles attached to them. Honestly, no one ever refers to people by those titles, but they do help determine and define a couple of things in the workplace. First of all, let’s establish the main titles themselves. Different jobs can have different titles, but there are still the main, staple ones that every industry has somewhat agreed upon using. There are three main titles, and those are the ones that we’ll be using in this article. They go as follows – entry-level (often referred to as the “beginner”), junior and senior. Each one of these titles carries a different representation. For example, when you hear the term “beginner graphic designer”, you probably have different thoughts than when you hear, for example, “senior graphic designer”. And these differences don’t only apply to the realm of the average graphic designer salary. They are used to explain a designer’s experience level, knowledge pool, dedication and many more different things. So, with all of that said, there’s still one thing that we need to do before actually starting to talk any specific numbers. As you’ve already guessed, it’s impossible to give a specific graphic designer salary – each of the different types of graphic designers have different salaries – that means that I’ll give you three different numbers. However, before I do that, we need to discuss the three types a bit more in-depth. Now, don’t worry – I won’t go over every single little thing there is. But a short introduction and a few key differentiating points will help you develop a pretty good idea of what each of these groups gets paid their graphic design salary for. Entry-level designers are usually people that are fresh out of school or have just recently finished a course on graphic design and are now ready to apply their newly-acquired skills in practice. This beginner group of graphic designers mostly consists of people who have no prior work experience – they are looking for their first stable job, and are yet to decide whether or not the field of graphic design is truly for them. This is because sometimes, everything looks all fine and dandy in an enclosed, learning based scenario (such as a university, school or individual studies at home), but as soon as a person is placed in an official position, they see that, unfortunately, this line of work simply isn’t for them. That being said, a lot of employers understand that senior designers were also beginners at some point in time in the past, and are ready to give current newbies a chance. Entry-level graphic designers mostly get very introductory, learning-based tasks. These are tasks that do need to be done for the company, but they are also simple enough so that a beginner graphic designer wouldn’t get stuck in the middle of the process. When it comes to the entry-level graphic designer salary, it varies. Since it’s impossible to distinguish a freelance graphic design salary (everyone has their own rates in mind), we’ll be concentrating on people that actually go and work for companies. Junior graphic designers are people who already have some experience in the field of graphic design. As opposed to their beginner colleagues, junior designers have already learned the tropes of the industry, and the fact that they’ve decided to continue to work as graphic designers shows their dedication to this career path. Furthermore, junior designers are usually more skilled than beginners – this is because they have already had opportunities to expand their skill set and knowledge. These people are what makes up the majority of the workplace. If you have 100 people working for you, it’s very probable that at least 51 of them will have the “junior” title attached to their profession. Seeing as this is the case, you can probably understand that this group of employees is very broad – you have newcomers trying to become junior designers, and the latter trying to get into the prestigious ranks of senior graphic designers. Junior designers work on the common, everyday tasks that a company might have and provide them with. I, of course, am generalizing, but exceptions are just that – exceptions. As a general rule, however, junior graphic designers are at that stage of their careers where their income depends almost exclusively on the amount of work that they do and the speed with which they work. If you’re wondering how much does a graphic designer make, this is something that you should definitely keep in mind. Since there’s so much overlap happening on both ends, the junior graphic designer salary tends to get pretty skewed. It’s tough to say how much do graphic designers make when the number is constantly changing. However, that is still something that we’ll try to do. Until then, though, we still need to cover one last group of graphic designers – the senior ones. Let’s quickly get that out of the way. Senior graphic designers are the people that have been in this industry for the longest time. They are individuals who have managed to find a compromise between their individual creative ideas and those that are applicable to their respective workplaces. Everyone is used to think and wonder how much does a graphic designer make. However, it’s rare that people would also consider how much work actually goes into becoming a good and reputable designer, and then taking all of that to the next level. First of all, you have to develop a reputation in the field. You do so by working super hard – or, by what a lot of people are now used to refer to as “hustling”. And it’s not enough to simply do a “9 to 5” and be done with it. Senior graphic designers commonly do a lot of extra work from home – they perfect their craft at any opportunity that arises. That being said, they are also the people who have the most responsibilities in the company (at least when it comes to the responsibilities that a senior graphic designer might have). In addition to their daily tasks and individual projects, senior members are also often tasked with keeping an eye on or even training newcomers to the company. Well then, now you know the intricacies of all of the three main groups of graphic designers out there. Knowing all of the information that we’ve already discussed in this article, I think it will be a lot easier to understand the answers to the question “how much do graphic designers make?”. Before we begin, I’d like to stress a couple of things. First of all, I’ll be referencing the average US salary, just for comparison’s sake. At the time of writing this article, it is around $3700 USD per month. And another thing – do keep in mind that these numbers are just estimates, and they do not necessarily represent the actual average graphic designer salary. So, without further ado, let’s start things off with the entry-level designers. Entry-level graphic designers are the individuals with the lowest salaries out of the three groups (oh really..?). Having said that, people still say that they receive a great salary, especially when you keep in mind the actual work that they do. Let’s take a look whether that’s true or not. According to Payscale.com, the entry-level graphic designer salary should be around $40,600 USD per year. This comes out to be $3380 USD per month. As I’ve mentioned a bit earlier, junior graphic designers are the most difficult to analyze when it comes to the junior graphic designer salary. Glassdoor.com, however, still provides us with a specific number. 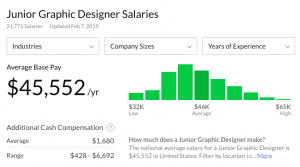 According to the site, a junior designer can expect to make around $45,500 USD per year. That comes out to be almost $3800 USD per month. All things considered, that’s actually a pretty low salary! It’s slightly a bit over the average salary in the US, but it’s still quite low when compared to the amount of work that graphic designers have to put in to become professionals at what they do. Finally, we have the senior graphic designer salary. Let’s not waste any more time and find out how much do these expert make. 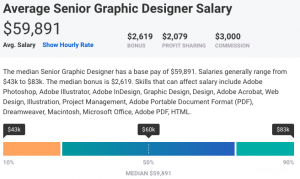 According to PayScale, the senior graphic designer salary should be around $60,000 USD per year, or $5000 USD per month.